**First off, all of us here want to send our thoughts out to Mauro Ranallo and his family. His mother was rushed to hospital on Wednesday evening just hours after Mauro had come home to British Columbia for the holidays. Today is also Mauro’s birthday and we all hope this ends up as a happy one. **The WWE and the USA Network have announced that the opening hours of Raw and SmackDown Live next week will be airing commercial-free. It is a strategy designed to build a strong opening hour of each episode with the hope that there will be a stronger retention of viewers throughout the rest of the shows. 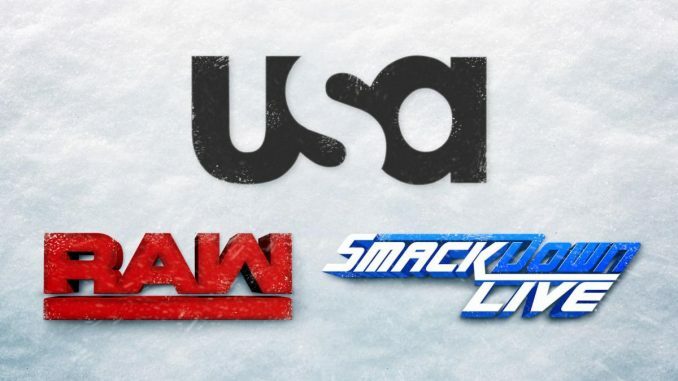 The USA Network attempted this strategy once before with an entire episode of Raw airing commercial-free in June 2009 and was a big success viewership wise. The negative for the network is that without any commercial inventory, the large audience isn’t of any value to existing sponsors and thus this seems to be a compromise with only a portion of the show airing commercial-free. **Dean Ambrose underwent surgery to repair the damage to his triceps tendon. The WWE provided an update and stated that the 40-minute surgery was performed by Dr. Jeffrey Dugas. Dugas stated that Ambrose tore half of his triceps tendon off the bone with the extra bursal tissue removed from the elbow. Ambrose has already begun light therapy, but it was not stated how long Ambrose is expected to miss action for. **This past Tuesday’s episode of SmackDown Live averaged 2,578,000 viewers on the USA Network, which was a small increase of 4% from the week prior. This week’s episode was coming off the Clash of Champions event and the follow up involving Shane McMahon and Daniel Bryan. **In the wake of their divorce with FloSlam, WWN Live has announced the launch of a subscription service for their family of wrestling promotions. The service will be marketed as “Club WWN” and is being offered free for the first-month for anyone that signs up before January 31st. After the free trial, the service will be $9.99/month with access to their back library (which they currently have more than 360 shows uploaded from EVOLVE, Dragon Gate USA, FIP, SHINE, Style Battle & others). The newer shows will be uploaded approximately two-weeks after they take place. With the shutdown of FloSlam and a potential legal battle looming earlier this year, WWN Live was forced to scramble for a new distribution method. They also had to adapt their financial model with the multi-year deal with Flo falling through, which would have guaranteed enormous revenue for WWN over the life of the contract, which was announced in late 2016 when FloSlam launched. It is the best we can do as a small business at the $9.99 price. If we get a huge response, can consider other options, but right now it’s impossible for us to give live iPPVs at that price. We are trying to follow PROGRESS model with this. **AXS TV has announced that they have signed Jim Ross and Josh Barnett to new deals and they will continue to call New Japan Pro Wrestling for the network. Ross will continue to work for both AXS TV and the WWE as a result of his re-signing with AXS TV. The two will be calling AXS TV’s coverage of Wrestle Kingdom 12, with a three-hour block scheduled to air on Saturday, January 6th at 8 pm Eastern. **It was first reported by Justin Barrasso at SI.com, Will Ospreay has been added to a pair of WWN events over WrestleMania weekend in New Orleans, Louisiana. Ospreay’s deal with Ring of Honor recently expired and allowed Ospreay to take North American dates elsewhere. Ospreay will be working the EVOLVE card on Friday, April 6th and the WWN Supershow on Saturday, April 7th. **MLW will be holding their first card of the new year on January 11th in Orlando at the Gilt Nightclub. Earlier this week, they announced a big singles match between brothers Penta el Zero and Fenix for the card. The card will also feature: Jimmy Havoc taking on Shane Strickland in a Death Match, a “Super Fight” with Low Ki taking on MVP, a tag bout featuring Tom Lawlor & Seth Petruzelli facing Matt Riddle & Jeff Cobb and on Thursday they added a singles match with Sammy Guevera taking on Darby Allin. Tickets for the show are on sale at http://www.mlwzerohour.eventbrite.com. **Congratulations to Taz, who will be co-hosting a new morning drive show across the U.S. on CBS Sports Radio. Taz and Marc “Moose” Malusis will be co-hosting the 6-9am Eastern show and it will launch on Tuesday, January 2nd.